"The light of my path and life of my life "
The sun was up today and the cloudless open blue sky was gazing at the cosmic panorama. The murmuring sound of the Bhagirathi was simply soothing the environment. Sky touching trees of Deodar and Pine were singing the glory of purity and ringing bels like; the blowing breeze was very firm in its message “ March Forward, you will obtain your aim”. Now and then a holy sound of blowing conch was only a little amusement in the absolute silence of Gangotri. We were just sitting surrounding Swamiji Maharaj at our Ashram’s small little Kutir at Gangotri. 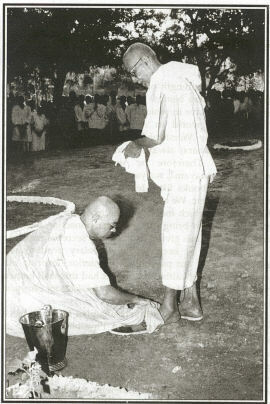 It was just after our All India Tour that he wanted us to have a little physical rest and rejuvenate ourselves, to boost up once again for the holy Birth Centenary Celebrations of our pujya Gurudev Sri Swami Sivanandaji Maharaj. Like the external surrounding environment, the revered Swamiji’s health and mood were simply illuminating and vibrating with supreme bliss. In this blessed mood he narrated this episode: “ It was winter. With the kind permission of revered Guru Maharaj I decided to go on a pilgrimage of Sri Tungnath. En-route, I arrived at Rudraprayag at the very late dusk, when practically all persons had gone inside their small huts and were confined to retirement or to warming up in front of little wood or charcoal fires. But the old Pujari of the small little temple was busy winding up his evening service to get back to his home. At that moment I entered the temple where only 2 or 3 kids were present in the hope of receiving a little prasad from the temple worship. It seems that the Pujari was happy to listen to the hymns chanted by me with correct pronunciation along with him in the concluding prayer. He was kind enough to ask me about my affairs, whereabouts etc. He gave me sufficient prasad to eat and directed me to a place where I could spend the night. But, at the same time, he warned me that by this time Tungnath Yatra was over and in this severe cold I would find hardly anybody living there. I thanked him for his kind gesture. But when I came out of the temple, I found my chappals missing even my blanket and my shoulder bag too were missing!!! I was happy, indeed, because I rejoiced in God’s welcome to his holy abode just one is suppose to be! Of course, it was not so easy. I had to go through a very difficult and fearful dense forest and a heart shaking atmosphere. The route was unknown to me. There was no footpath. I was not equipped with any eatables, nor did I have proper information about the route. Climbing up on the hills, rolling down on the rocks, getting pricked by thorns, I was attempting by myself to achieve the joy of darshan of the Supreme's throne. It was actually rock climbing without a rope, climbing without any proper equipment. Oh I can’t express all that in words. On my way while practically exhausted, I was brought up by the Lord to a little field with meadows. To my utmost surprise, after an hour or so, one shepherd passed through. He offered me a little milk and some eatables and helped me with an explanation of the path to the Lord’s holy abode. But, he had to go away because his kith and kins were in an altogether different direction. I retired underneath a huge sloping stone in its protective care. Very late at night, I felt a comforting warmth, solace with comfort. Lying down with closed eyes, I was really enjoying a warmth delicacy. After a while, I realized that something is moving along my body; whether I was getting comfort from it or it was getting comfort from me? Slowly, I opened my eyes. I tried to realize as to what was the matter. Oh, la! la! that was a wolf and he jumped away in the darkness. The sky was open and blue. The stars were rejoicing in the serenity of the towering ice peaks of the eternal Himalayas. I too, tried to become one with that Supreme, who was dwelling in the form of the great Himalayas. We are not worthy to express our feelings about him but we know he is He. An embodiment of perfection, rhythm and harmony! Hail! Hail! Chidananda! OM Shanti !